When Elon Musk isn't busy playing with rockets, he's also got a number of other companies that he's handling. There's Tesla, which is trying to take over the car world, and then there's Hyperloop - the space age transport system which hurls passengers at incredible speeds through tubes to get them to their destination (seriously). This pipe dream may well become reality, thanks to a permit to create a Hyperloop which goes from New York to DC. If successful, it will transport people between the two places in a touch under 30 minutes! The New York Toy Fair is one of the greatest places to see the best toys in the world. We were there and there were 11 fantastic playthings which caught our eye. 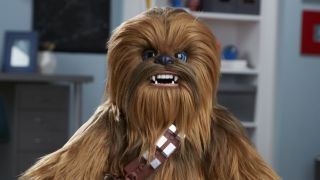 They include an interactive Chewbacca, a remote-control Rocket League game tie-in and loads of AR goodies. The Google Chromebook has grown from being largely ignored by the PC community to a cheap and cheerful alternative to more expensive laptops. One new feature that will be welcomed by users is split-screen mode - so you can have, say, two apps up on the screen at once. It's not official yet but some eagle-eyed people have seen it in action. Google is always finding new and useful ways to use its data. The latest is using an AI algorithm which scans your eye for information. And there is a lot it can find out about you by looking into your eyes: your age, if you smoke, blood pressure etc. It then uses this information to determine how at risk you would be from heart disease. Clever stuff. The Samsung Galaxy S9 is less than a week away from making an appearance but it seems that some people have already had time with the device. It looks like we are getting a 5.8-inch Super AMOLED screen, fingerprint scanner, octa-core Exynos 9810 chipset (clocked at up to 2.9GHz) and 64GB of storage. We'll have to wait to see whether this will be the iPhone X killer Samsung wants it to be.